Carlos Topp, a community organizer from Detroit’s West Side, and Fiana Arbab chair the Detroit Assembly. 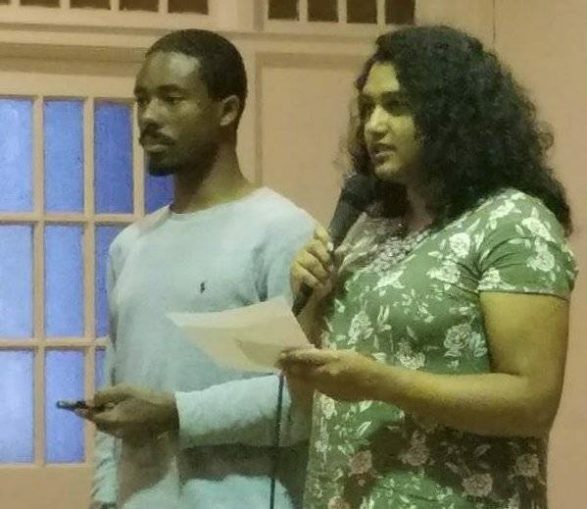 A people’s assembly in Detroit on Oct. 26 brought together a broad array of community organizations and activists united in their vision to rebuild this city, which has been hard hit by the ravages of capitalism. The meeting, billed as “Real Detroiters Speak Out,” was held to counter the message of Detroit as a model for “urban revitalization” being touted at the World Conference of Mayors, which took place at the MGM Grand Hotel that week. It turned out the mayor’s conference was a dud, with only a few dozen participants. In contrast, the people’s assembly and speakout grew steadily throughout the evening. About 150 activists spoke on and heard about the role of the banks, global corporations and political comprador elites in perpetuating the superexploitation of the majority African-American, working-class and poor residents who have been totally left out of the so-called rebirth of Detroit. The event was initiated by the Moratorium Now Coalition and held at St. Matthews St. Joseph Episcopal Church in Detroit, a historic sanctuary tied to the Black Liberation struggle since the time of the abolitionist movement. 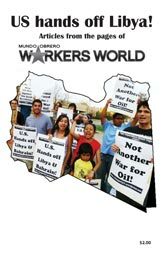 It was chaired by two young activists, Carlos Topp, a community organizer from Detroit’s West Side, and Fiana Arbab, a former leader of the Social Justice League at the University of Michigan Dearborn. The evening began with a showing from “Looting Detroit,” a film produced by community activists Jean Vortkamp and Jan Bendor. Then an array of activists, too numerous to all be called on in the time allotted, spoke eloquently on the various struggles of the workers and oppressed people of Detroit. Will Copeland from Breathe Free Detroit, an environmental justice group, described how asthma rates in Detroit are five times higher than the rest of Michigan. Jonathan Roberts, from ROC [Restaurant Opportunities Center] Michigan, talked about organizing efforts among restaurant workers, whose minimum wage is only $3 per hour in Michigan. He described the origin of food-service work in slavery and how it ties to chronic low wages especially for African-American women workers in the industry. Yvonne Jones, representing the Detroit Active & Retired Employees Association, described the devastating effects of Detroit’s bankruptcy on city of Detroit retirees, whose pensions were robbed to pay debt service to the banks. Other speakers included Baxter Jones, on behalf of persons with disabilities and one of the Homrich 9, who were arrested for blocking contractors from carrying out water shutoffs; Durk Barton, a street artist representing the Michigan Emergency Committee Against War & Injustice; Dr. Penny Logan for Unemployed Detroiters, fighting to insure that a job is a human right; and a representative from Votes not Politicians, petitioning to end gerrymandering in Michigan. John Philo from the Maurice Sugar Law Center explained his organization’s lawsuit to recover the $7 billion in lost revenue-sharing stolen by state government from cities across Michigan. Jim Anderson, professor of history at Michigan State University, gave statistics documenting the robbery of Michigan cities by the Pentagon war budget. Vanessa Fluker, people’s lawyer and longtime anti-foreclosure activist, outlined the targeting and robbery of Detroit’s African-American community by the banks, which led to 65,000 mortgage foreclosures from 2005 to 2009 in Detroit, and tens of thousands of tax foreclosures in the aftermath. Tom Stephens explained how Detroit’s tens of thousands of water shutoffs are a product of the plan to regionalize the city’s water system, to signal to the banks the extent to which the administrators will go to satisfy the banks’ debt payments. Tyrone Allen of the National Action Network spoke on the mistreatment of veterans in the city. A representative of the Detroit Independent Freedom Schools Movement described the destruction of public education in Detroit on behalf of for-profit charters, and their efforts to supplement city schools by teaching real Black history to the youth. Highlights of the evening included a video from young, anti-austerity activists in Puerto Rico. Katja Torres and Gabriela Ros, members of Our Revolution Puerto Rico and the Citizen’s Front for the Auditing of the Debt, gave a first-hand account of how the continuing lack of electricity and water in Puerto Rico since Hurricanes Irma and Maria is a direct result of the banks’ destruction of the island’s infrastructure. The crowd erupted into chants of “Detroit, Puerto Rico! Same struggle, same fight!” after their presentation. Kim Simmons, just released after 29 years since being sentenced to life in prison as a juvenile, said that despite a Supreme Court decision outlawing life sentences for juveniles, Wayne County prosecutor Kym Worthy has released only a handful of the hundreds of juvenile lifers impacted by this ruling. Marilyn Jordan, from the Detroit People’s Task Force, recounted their organization’s targeting of the Detroit crime lab for its mishandling of evidence leading to countless wrongful convictions. The speakout reflected the commonality of all the struggles affecting the oppressed in Detroit, and the need for unity to bring all the organizations fighting these battles together in a united front against capitalism and the banks. This call for unity in the common struggle was eloquently expressed by Maureen Taylor of the Michigan Welfare Rights Organization, Joanna Underwood of New Era Detroit and a delegation from Black Youth Project 100.